Just a few weeks ago, I wrote about seeing the Kansas City Symphony perform the 9th Symphony of Beethoven. Of the many things that stood out from that evening, it was the the 120 person strong chorus that really won me over. The human voice connects with emotions that instruments are not able to touch, which is one reason I have always loved choral music. 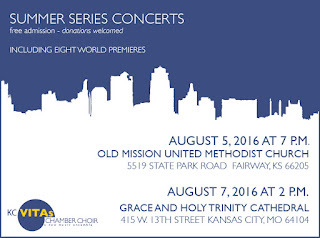 A friend of mine who is a singer with a new local choral group reached out to me about KC VITAs (Thank you Gayle! ), a choral group here in KC that came to life last year (2015). She connected me to the Founder, Executive and Artistic Director, Jackson Thomas, whom I sat down with recently to talk to. This amazing young man has created something very special here in Kansas City. They are preparing for their second set of concerts on August 5th and August 7th. Here is our conversation. TH Who is Jackson Thomas? Tell me a little about yourself. JT What a loaded question! (laughs) I grew up in Carrollton, Missouri, which is an hour and a half from here...northeast… a little town between Marshall and Chillicothe. I went to the University of Nebraska in Lincoln (vocal performance major). I thought I wanted to be a professional opera singer, and that was the only thing I could do to be happy. While I was there I had roles in opera and musical theater, and then studied abroad in Berlin. I almost got a major in German because of that...I was two classes away but I wanted to make sure I took opera history! I moved back here after I finished…I have some family in the area. I took a year of preparation as I call it before Grad school. I realized half way through my junior year that choral music was where I was going. That was something that I just always went back to over and over and over and realized that if opera didn’t happen that I would be OK with that. I think lots of musicians go through similar things….you never know what it is. But I definitely know that I haven’t had more moving experiences than I have had being in front of an ensemble. TH How did you develop a love for singing? JT My family is incredibly musical. I don’t know of anybody in my immediate family who can’t sing. So they were always very supportive of that and wanted me to do it. I also played saxophone and was a drum major for several years. My teachers in school were a husband and wife team and they were really good about getting people where they needed to be. They saw talent in me and connected me with teachers. I started private vocal study at the University of Central Missouri with Dr. Roden. This groomed me for that next step of collegiate study. TH How old were you when you realized that you could sing? JT About 5th grade. I knew before then that I could at least match pitch, but it was 5th grade when I really began to sing. TH Was there any magical moment in your formative years where you realized that you loved music? JT What’s funny is I was waking up every day…I know this sounds cheesy…but I was always waking up with a song in my head. I didn’t think it was weird until I talked to other people and that didn’t happen. Early on I thought I wanted to be a teacher. I used to say, “I do not want to do opera…they can’t make me do it” until I went to my first opera at the Lyric and saw La boheme. I remember sitting in the audience and saying “that’s what I want to do”….(laughs). TH Did you study conducting in school? JT I did, and that was incredibly instrumental for me. Conducting was something that seemed to come very naturally to me and others said it was something I should consider doing. And it was in college that I started my first group. TH What brought you to KC after you graduated? JT I graduated in 2014. I have family in the area and I knew I wanted to move back here for a year before auditioning for Grad schools to study choral conducting. I started teaching and getting into several different choirs here and then I auditioned at seven universities all over the country for Grad school (that was insane!) I decided on KU, so I am now half way through that program working on a Master’s degree in choral conducting. I’m a full GTA (graduate teaching assistant) so I teach and last semester I conducted the Vocal Music Collegium, which is an early music ensemble. I also co-directed the KU Women’s Chorale and the Concert Choir. This year I will be the Director of the KU Men’s Glee Club, which has never happened to a Master’s student. TH Wow, that’s very cool. JT I am very excited about that for sure. TH How did KC VITAs start? JT During my first year back I knew I wanted to start a choir. A friend of mine and I were talking one night and I realized it was going to be harder than in Lincoln…there are so many choirs here already. TH Is Kansas City fertile ground for choirs? More than you realized perhaps? JT Oh yea….and I am still learning about groups that are here that I didn’t realize existed. Or that they have been around for so long. So some friends of mine that I sang with in AGO (American Guild of Organists. This is a national professional association serving the organ and choral music fields). agreed it seemed like Kansas City was missing something that focused on new music. I actually dabble in composing myself. I wouldn’t call myself something that I’m not, which is why I say I “dabble”. But I was friends with a lot of composers at UNL and I realized that these new pieces they were writing were great, and nobody is performing them. So I knew I would have plenty of pieces to perform, and the three of us made a pact that we would work hard to make this happen. We just went with it and started asking people all around. We started in May of 2015. I put an ad out on Facebook for compositions too. And how big it got was an accident. I am pretty relentless...persistent (laughing) until they give me an answer. I had six people give me premieres of some sort, Four of them were world premieres. We ended up with 21 singers last year for our first performances. This year we have 28. Patrick Neas from the Kansas City Star wrote about us and I think that was a big reason we were so successful. We ended up having 400 people at our concert….and we only printed 200 programs! We got a standing ovation at the end. It was really exciting. TH What did this success tell you about the arts community in Kansas City? JT Not only are they supportive of music, but its filling a gap…there is a need. Afterwards we got together and realized that we need to make this more “real”. I was footing the bill for everything, and people aren’t going to donate to something that they don’t really know, so we looked into the 501(c) (3) which has been huge. TH What is your “title” for this organization? JT I am the Executive Director and Artistic Director….as well as the Founder. I also serve on the Board at this point. TH Tell me about the name…KC VITAs….where did that come from? JT KC stands for Kansas City….of course….VITAs stands for vibrating internal thyroarytenoids. TH What does that mean (laughing)..? JT That’s literally your vocal chords….the tissue that make up your vocal chords. TH That’s pretty creative…did you think of that? JT I did. I knew I didn’t want to be called some cheesy Italian name….I was really into vocal pedagogy at UNL…the science behind the voice, and I just thought that it fit in a few ways. It satisfied my nerdiness, but also VITA conveniently means “life” in a few languages… so new life…new music. TH How many scores did you receive from composers hoping to have their music performed? JT Last year, I put out a call for scores and received music from 15 people. This year, over 50 people submitted music….and that’s 50 different composers…some of them would send more than three compositions. TH That’s a lot to sort through! JT Indeed. And we are not just a chamber choir…not all of the submissions were choral works. Some were art songs. We are really a new vocal works organization, and our concerts are not going to have just choral works on them. They’ll have art songs too, and I will have other forms of vocal music as well. JT Yes…it’s a fancy way to say just a song with voice and piano. Not an aria because it does not belong to a large work…just solo voice and piano. TH Will any of the composers be here for the concert? JT Several of them will be. We have composers from all over the country…Florida, South Carolina, New Jersey, Pennsylvania, Minnesota, Nebraska, Kansas and Missouri. I would love to require all of them to be here (laughing)! So we have eight world premieres this year. What we really want to focus on is that we are giving young and rising composers a chance for their music to be performed and not charge them to do so. Other arts ensembles may also be willing to perform your works, but then you will get a bill! TH How often do you all rehearse? JT Once a week…Tuesday night for two hours…7-9 pm. I try to be very respectful of their time because I am very lucky to be in front of them. Last year we had five choral pieces, but this year we have nine. TH Where do you see VITAs going? JT Right now VITAs is a summer organization. I would love to see it go year round. I’d like to continue to have our showcase in the summer, but also do a Fall concert. Believe it or not, I have been given a lot of Christmas music! Out of that, I could make a great Christmas program. And then in the Spring, perhaps do a large work. TH What are your interests outside of music? JT I make my own beer. Traveling and hiking are also huge interests of mine too. And if I had time, I also compose music. I also have 3 cats…Walter, Edith, and Bradley. TH OK, now the hard questions. I talk to a lot of musicians who tell me they don’t listen to much music. When they have free time, which is not often, they don’t want to listen to music….they want a break from it. Do you listen to music for enjoyment, outside of work? JT Oh my god, yes all the time. TH What’s on your playlist at the moment? JT I do a lot of exploring, but I’m into anything where I can hear a real voice. I really like Ben Rector. I listen to a lot of musical theater…probably way more than I want people to know about (laughing)..
TH Do you have a favorite musical? JT My favorite musical is Cats. I played the lead role. TH Who is your favorite jazz singer of all time? JT That is a hard question. TH I always say Ella Fitzgerald. JT I know it’s watered own, but I like Michael Buble a lot. If I could be a jazz singer, I think I would be happy. Nnenna Freelon is fantastic and I really enjoy her music too. TH What about classical music? JT Juan Diego Florez is my favorite tenor…hands down. I saw him in Berlin, and I think he’s awesome. I love Renee Fleming. Stephanie Blythe is wonderful. Deborah Voight…I really love her. TH What about classical composers? 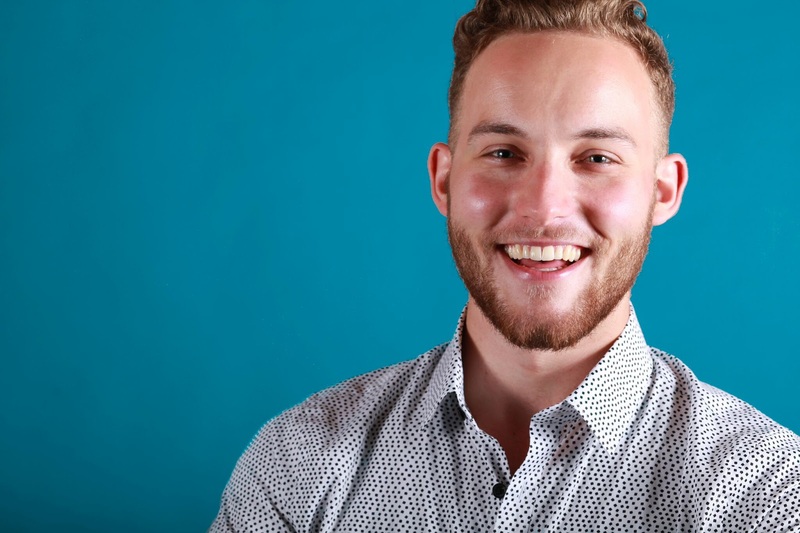 JT Rienberger….Joseph Rheinberger…wow. I think he’s totally underrated, especially in the choral world. His Mass for Double Chorus in E-Flat is…wow. Um…(thinking)..I know this sounds weird, but somebody I really like, at least in the sacred repertoire now, is Dan Forrest. I am directing Requiem for the Living next year at St. Paul’s. I’m really moved by that. Moving backwards, Handel is my favorite composer. TH Will the upcoming KC VITAs concerts be recorded? JT Yes they will, and we will produce another CD from the live recordings. TH I can’t wait to hear it! I really appreciate you taking time to talk with me! Good luck on August 5th and 7th. JT You’re welcome! Thank you. Fabulous interview, Tim! 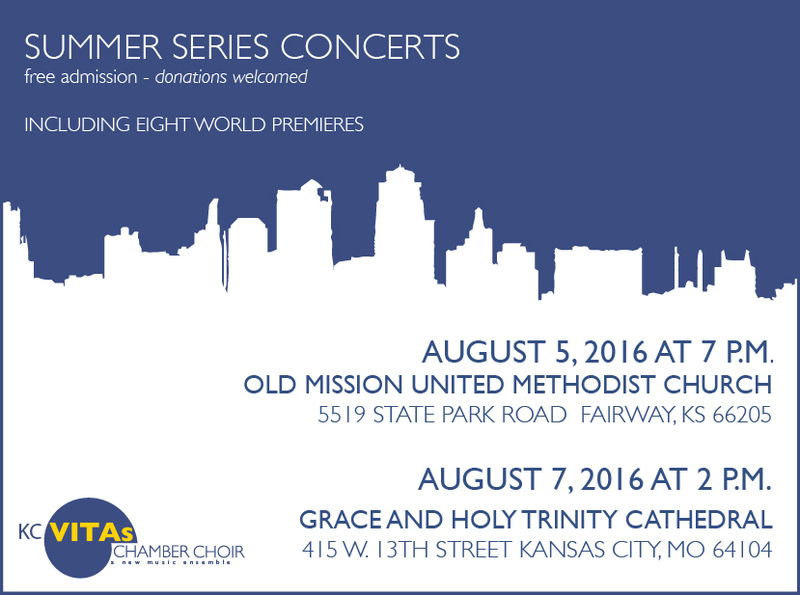 Thanks for helping to get the word out about the KC VITAs Chamber Choir concerts next weekend. I so enjoyed learning more about Jackson Thomas in this piece! Hope to see you on Friday evening and Sunday aternoon, August 7th at the receptions afterwards!